Upon arriving at the place, they saw the child with his mother Mary. 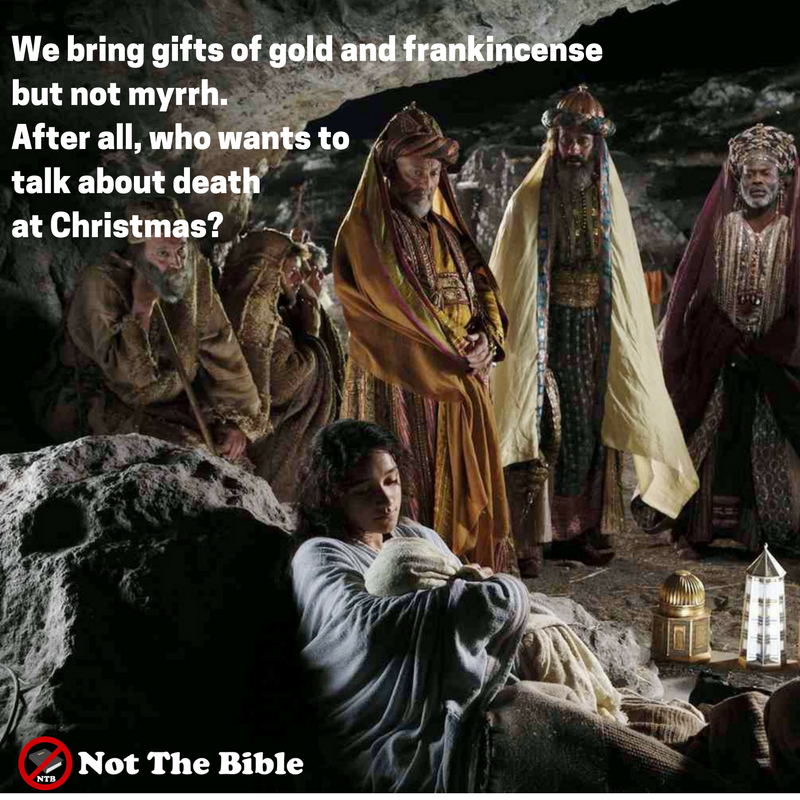 They opened their gifts of gold and incense, but not myrrh to embalm him. According to the Scriptures, this King’s throne would last forever. Gold is a gift fit for a king, as Jesus was born to be a king whose kingdom would last for ever (2 Sam 7:12-16). Frankincense is the incense used by priests in their sacred duties when entering God’ presence in the Holy of Holies. Jesus is the great high priest who enters the father’s presence in Heaven (Heb 4:14). Myrrh is used to embalm the dead. We can miss the shock of this because of the strangeness of the gifts. Imagine you’ve just given birth to your first child and in come the visitors to coo over the baby and bring gifts of cute baby grows and rattles and soft toys and blankets. Then someone turns up and brings a coffin as a gift. How inappropriate! This is a moment of celebration of life not a reminder of death. However, Jesus was born to die. Jesus was slain before the foundation of the world (Rev 13:8). It wasn’t an accident orchestrated by the jealous Pharisees, it was always the plan. Behold the lamb of God who takes away the sin of the world (Jn 1:29) – the Passover lamb who was sacrificed to save us from death. The reason the son of God appeared was to destroy the devil’s work (1 Jn 3:8) which he triumphed over on the cross (Col 2:15). OK, but a coffin given to a baby? That’s why a lamb was slaughtered for sin – the lamb is innocent – as Jesus is – a baby represents that innocence – he doesn’t deserve to die – but yet he chose to. That’s why Jesus deserves everything. Now here’s where it gets really uncomfortable for us. Just like Jesus, we are also born to die. Don’t hear that preached often do you? calls us to take up our cross and follow him (Mt 16:24). We are born to sacrifice our selfishness so that he reigns in us. We are called to love and love is inconvenient. Love requires sacrifice. We can only have one master and it ain’t us. We are Disciples of Christ and so will be like him when in the Garden of our heart we cry out “not my will but yours be done”. Jesus, thank you that you were born to die. Thank you that even though you were innocent you sacrificed yourself for me. Forgive me that I only want the nice part of Christmas and Christianity. Forgive me that I want all the blessing, all the honour, all the power, all the glory but without the sacrifice. Help me to give up my life so that I meant inherit true life. In Jesus’ precious name. Amen. If you enjoyed this article, then I do recommend Travis’ blog post on uncrucified christianity.